K&N PS-2002 - Pro Series Canister Oil Filter Height: 3.5"
Fram Extra Guard Oil Spin-on Filters are the number one choice in oil filters among consumers because they have twice the dirt-stopping capability of any other leading oil filter brand. Oil that lubricates and cools the engine is picked up by the engine's oil pump, cleaned by the oil filter, and reused. It is vital that any dirt or contamination picked up by the circulating oil be removed before it is pumped back into the engine. Tiny dirt particles between 10 and 20 microns do most of the damage to bearings, cylinders and other moving engine parts by rubbing and causing wear. That's where FRAM Extra Guard Oil Filters come into play. Tests have proven that FRAM Extra Guard filters stop up to six times more of these particles than any other leading brand. Sold individually. FRAM Extra Guard has a multi-layer glass fiber filter media. It's thicker and denser than conventional media, providing a maze to trap contaminants more effectively. Before oil enters the engine lubrication system, it passes through the oil filter. The filter's job is to remove potentially engine-damaging dirt particles. To provide the best engine protection, the maximum amount of dirt should be removed the first time the dirt passes through the filter before it reaches the engine. The Society of Automotive Engineers run a test called the "Single Pass Efficiency Test" (SPE) to measure a filter's ability to provide engine protection. The SPE Test is one of the industry standards for evaluating and comparing oil filter performance, and measure a filter's ability to remove dirt the first time through. The FRAM Extra Guard filter performs at an unprecedented 96.2% efficiency in the single-pass efficiency tests. The average efficiency rating for other leading brands is only 74.6%. And like the FRAM Tough Guard oil filter, Extra Guard features advanced synthetic glass and cellulose media, which is a combination of synthetic glass and cellulose uniquely formulated for top-rated efficiency for the life of the filter. 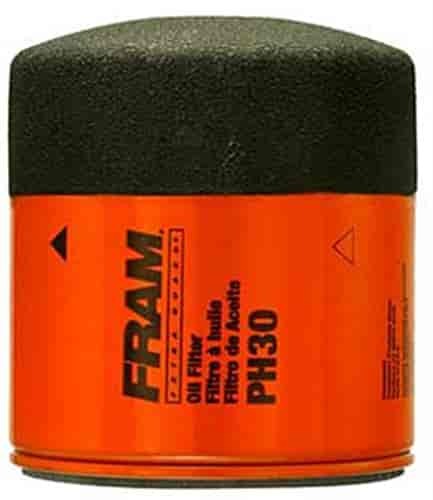 Does Fram PH30 fit your vehicle?